An Italian style beef meatball, Daily Chef Casa di Bertacchi brand are made from a special family recipe and come fully cooked, are gluten free, and available exclusively only at Sam’s Club. They are delicious and at 5/8-ounce each, the perfect size for hurry up dinners, making everything from spaghetti and casseroles, to soups and stews, super easy during these busy holidays. Lots of different options to prepare them too - from oven to stove top to slow cooker. Since this bag is a hefty 6-pounds, you've got options for multiple meals in this single over-sized resealable bag too. It was just one such night, when I'd had a super busy day and was especially tired, and just couldn't even think of a meal to start with, that I remembered I had these meatballs in the freezer. A quick defrost in the microwave and I browned them in the oven for about 15 minutes on the convection setting. 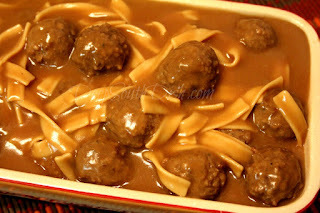 While those were in the oven, I made a simple brown gravy, and boiled the tail end of a bag of egg noodles out of the pantry, added a canned veggie and a simple salad and before I knew it I had a quick, easy and delicious meal. 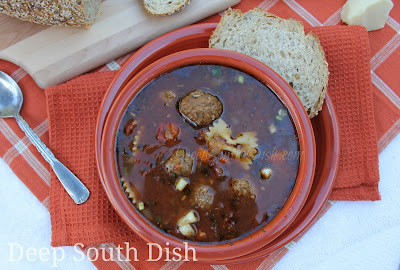 My husband loves to eat these meatballs straight out of the oven, but he also loves gravy, so it was a win-win for him, and super easy and stress free for me. Gotta love that! 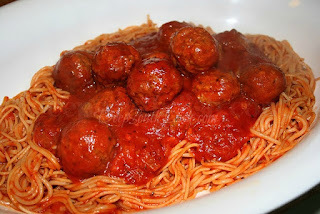 Of course, I'm also a real fan of a quick, semi-homemade spaghetti sauce with meatballs, and with Daily Chef Casa di Bertacchi meatballs, it's one of the fastest, tastiest meals you could ask for. 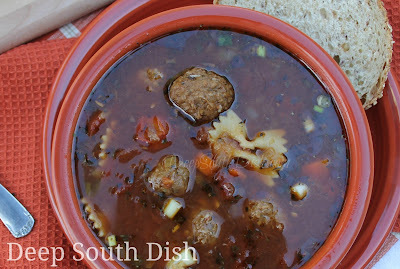 Next, I decided to do a soup, because with everybody coming and going at different times, and drop by holiday guests, it's a great meal to make and leave on low on the stovetop or hold in a slow cooker on warm. Loaded with flavor, it only gets better as it sits, as the meatballs continue to soak up juice and flavor from the vegetables and broth. I didn't brown the meatballs, which is another time saver, although you certainly could. 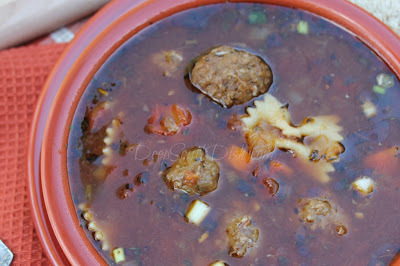 The meatballs held up beautifully in the soup without browning though. As with all soups, I prefer to prepare the pasta separately since it tends to soak up a lot of the liquid otherwise, so have a covered bowl of already cooked pasta at the ready. Then everybody can add the pasta to their own individual bowls before spooning the soup on top. 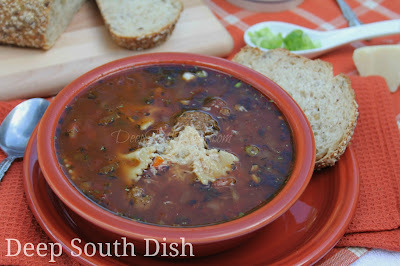 Serve it with a good, crusty bread and offer a fresh chunk of Parmesan cheese and some extra green onion for garnish. 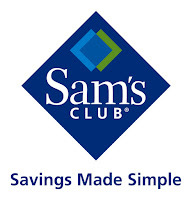 To find a Sam's Club near you click over and use their store locator, and for more recipes using Daily Chef Casa Di Bertacchi Meatballs pop by their website. 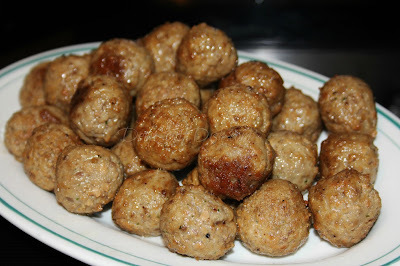 Thaw meatballs in refrigerator overnight, or use the defrost setting on your microwave. Prepare pasta, drain and set aside. Meanwhile, heat olive oil in a soup pot over medium heat and add onion and celery, cooking until tender, about 5 minutes. Add garlic and cook another minute. Add seasonings; cook and stir for 2 minutes. Stir in tomatoes, beef broth, water, Worcestershire, beef base and Kitchen Bouquet, if using. Set aside 2 tablespoons of the green onion for garnish and add remaining green onion to the soup, along with the mixed vegetables and meatballs. Simmer until meatballs are cooked through, and vegetables are tender, about 15 minutes. Taste and adjust seasonings as needed. Spoon pasta into serving bowls and ladle soup over the top. Garnish with reserved green onion, freshly grated Parmesan cheese and serve with a crusty whole grain bread. Disclosure: This post is part of a series for the 2015 Daily Chef – Casa di Bertacchi Meatballs Ambassadorship program to help show how to save time and prep making delicious, easily prepared meals using Daily Chef Casa di Bertacchi fully cooked meatballs from Sam's Club. Participation in this program is voluntary, however, Sam's Club and Casa have provided me with compensation for this post. Original recipe was developed by me and all opinions expressed herein are entirely my own.